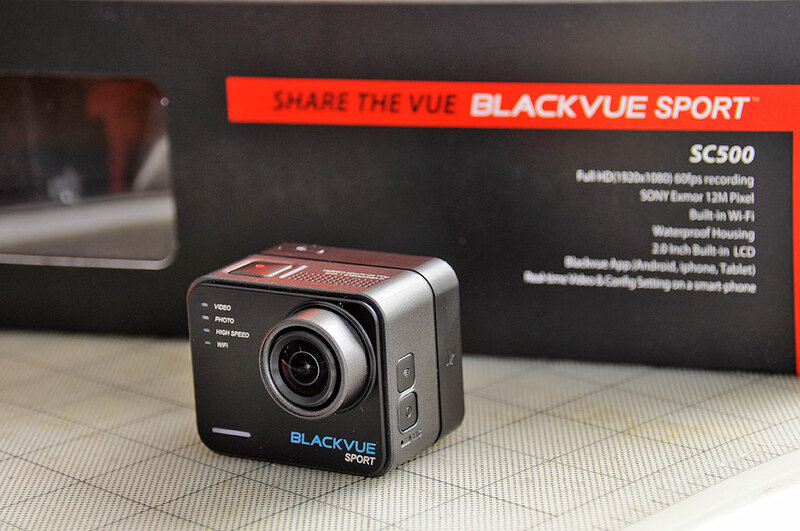 Last week we took a FirstLook at the BlackVue’s Sport SC500 action-cam. Today, because of requests from some very eager readers, we are going to take a CloserLook rundown of the the various mode and features of this little device. 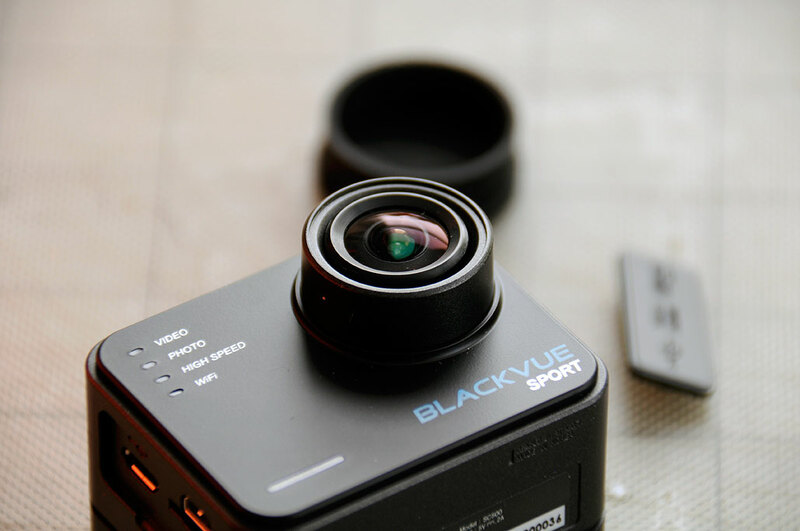 BlackVue Sport SC500 is small and lightweight, clocking in at 55 x 44.2 x 37 mm and 73 g. Its functions are managed by three control buttons: shutter (top), WiFi (left upper), Power/Mode (left lower). The speaker is next to the shutter on the top and the microphone is under the Power button on the left. 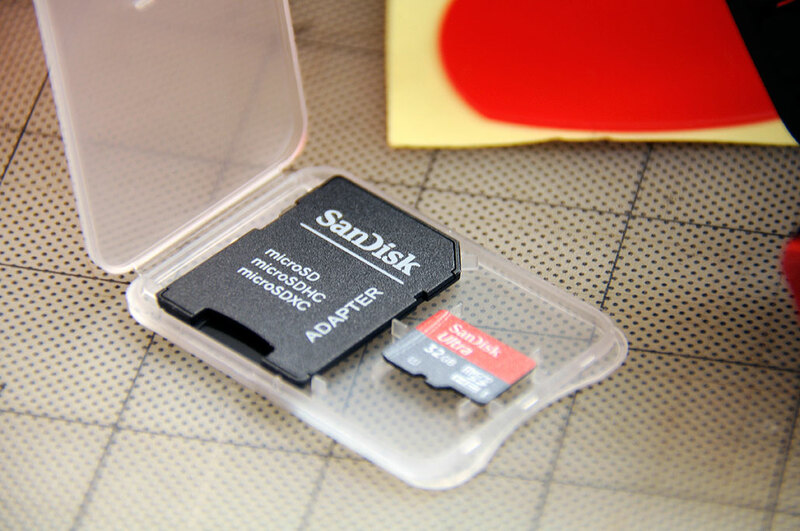 The two ports (USB, HDMI) and the microSD slot are on the right, covered by a lid (not connected and we expect, easily lost). The mode indicators are in the front (top: video, photo, high-speed, WiFi; bottom: shooting, charging). The 2″ LCD panel connects to the camera module to form an integrated unit. The Sport SC500’s lens is made of glass and has a 157º angle of view. This is more than twice as wide as a human’s view angle (about 60º). Because of that wide angle, there will be some distortion at the edges, but it is a reasonable trade-off for being sure of capturing the action. While the heart of any action cam is the camera, the mount is a very important supporting (pun intended) component. The Blackvue Sport SC500 comes with a very flexible mounting system. The system includes two mounting plates, a protective rubber casing, a locking knob, and a few pieces of 3M double-sided tapes. One mounting configuration was designed to allow the action cam to be attached to a flat surface (car dash, top/side of a helmet, etc). The other is for attaching the SC500 to anything with a standard tripod screw. Setup and adjustment is quick and simple. Just a few turns of the threaded knob will sets the angle of the housing and secure it to the mounting plate. We expect the waterproof case will attach to the mounting plates in much the same way. A complete CloserLook on that will be forecoming once we get the unit in house. The Blackvue Sport SC500 uses microSD cards (Class 10) for storage with a stated maximum capacity of 32GB. We found a SanDisk unit that had the right spec. It even came with an SD adapter…bonus! Even though we don’t yet have a waterproof housing for the action cam, that doesn’t mean we shouldn’t “house” everything in something waterproof. After all, it is likely that the camera will be used in some electronics-unfriendly environments 🙂 After looking around to see what we had available, we found the T5000 from S3 Cases to be perfectly sized for the task. We spaced out the pieces and found a workable layout. Note that we saved room in the upper left for when the waterproof housing arrives. Until then, we’ll have to be careful with where we use this little gem. While a waterproof transport case is great for getting the camera to the action in one piece, we still need a protective case for the camera when we are base-jumping off the Prudential Building in Boston’s Back Bay(don’t tell our copy editor, she’s not that intrepid). We are eager to get our hands on the waterproof housing and take this action-cam out for a proper FirstUse test. The good news from Blackvue is that they have resolved the production issue and one is on its way to us…so it won’t be that much longer!!! Happy Christmas and Merry Holidays!! !